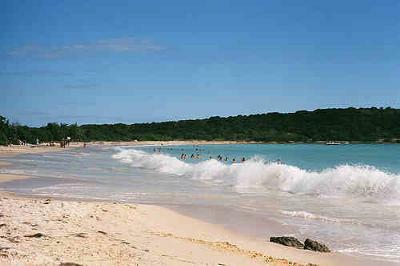 Our favorite beach is La Playuela in Cabo Rojo, Puerto Rico. La Playuela beach has a spectacular view of the cliffs in the distance of the Cabo Rojo light house from the sandy shore. The clear waters have a gorgeous blue color and are very gentle. It is also known as Bahia Sucia or Dirty Beach. This name comes because of the significant quantities of sea weeds floating in the water, some of these seaweeds end up in the beach and gives it a distinctive "marine smell" which is not necessarily unpleasant. This only happens during the cold weather months (November to February). This secluded beach is a favorite to our family due to the calm and shallow waters in the bay. It is part of a natural reserve but we come here late in the afternoon, however, because the sunsets here are breathtaking. We just visited this beach on vacation. The beach is fine but when we opened the window on the pot hole filled road on the way to the beach, where we also got a $50 parking ticket, we were knocked over by the aweful smell of the red foamy waters that are in the wild life area right before the beach. The winds blowing from the south keep the smell away from the beach. I was born not too far from the "El Faro" (the lighthouse)de Cabo Rojo and neaar "El Combate" (A local beach resort}. If some of you know where "La Gallera"(Rooster fighting Ring) and el "Parque de Pelota" (baseball park) are located, then you are familiar with the area. The roads leading to "El Combate" from out of town are awesome and the scenery is beautiful. La playa de "Boqueron" is a worthy resort and most breathtaking also. I encourage everyone to just enjoy "La Costa" overall. Just a word of caution: drive safely on the roads leading to La Playuela as there are many pot holes on the roads after "Las Salinas"(salt mines)leading to La Playuela. I loved the beach by the lighthouse so much that I have decided it is my dream place to get married. It is beautiful and peaceful.